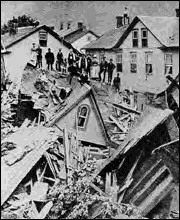 The Johnstown Flood has become a symbol of the havoc created by the elements gone wild. For days after the disaster, The New York Times ran articles spotlighting the flood itself and the predicament of those who survived it: members of a community whose understanding of disease and contamination was still rudimentary. The news industry's reliance on the telegraph made accurate reporting a challenge. Only long after the crisis did all the details become clear: On May 31, 1889, after days of rain, the South Fork Dam collapsed and unleashed 20 million tons of water from its reservoir. A wall of water, reaching up to 70 feet high, swept 14 miles down the Little Conemaugh River Valley, carrying away steel mills, houses, livestock and people. At 4:07 p.m., the floodwaters rushed into the industrial city of Johnstown, crushing houses and downtown businesses in a whirlpool that lasted 10 minutes. The water flowed through the arches of the Pennsylvania Railroad's stone bridge. The bridge stopped tons of wooden debris, which accumulated in a huge pile that trapped dozens of survivors. With aid from various sources, Johnstown rebuilt itself, and celebrated the hundredth anniversary of the flood and its people's resilience in 1989. 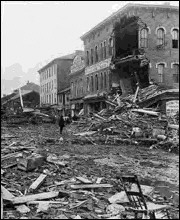 Pittsburg, May 31 - An appalling catastrophe is reported from Johnstown, Cambria County, the meagre details of which indicate that that city of 25,000 inhabitants has been practically wiped out of existence and that hundreds if not thousands of lives have been lost. A dam at the foot of a mountain lake eight miles long and three miles wide, about nine miles up the valley of the South Fork of the Conemaugh River, broke at 4 o'clock this afternoon, just as it was struck by a waterspout, and the whole tremendous volume of water swept in a resistless avalanche down the mountain side, making its own channel until it reached the South Fork of the Conemaugh, swelling it to the proportions of Niagara's rapids. The flood swept onward to the Conemaugh like a tidal wave, over twenty feet in height, to Johnstown, six or eight miles below, gathering force as it tore along through the wider channel, and quickly swept everything before it. Houses, factories and bridges were overwhelmed in the twinkling of an eye and with their human occupants were carried in a vast chaos down the raging torrent. The water began flowing over the dam or abutment at the weakest part of the mountain lake at about 1 o'clock, when Johnstown and people down the valley were warned by messengers to to look out for a flood as the result of a waterspout. Three hours later the whole end of the lake gave way, sweeping everything before it, railroads, bridges and telegraph lines included. The scene of the disaster is cut off entirely from all manner of communication and has been since 6 o'clock this evening, and fragmentary details of the character and extent of the calamity only have come to hand from various places in the valley. About 6 o'clock Superintendent Robert Pitcairn of the Pennsylvania Rialroad telegraphed from Sang Hollow, at the gap in the Laurel Ridge mountains west of Johnstown, that he he had seen about two hundred persons afloat on gondola cars, shanties, &c., and that the disaster was appalling. Telegraphic communication with Johnstown has been re-established, and the work of succor to the living and of burial of the dead is going forward under direction of organized volunteer crops of physicians and ministers from Pittsburg and every other city in the reach of the stricken and desolate valley. The latest information confirms the last appalling estimates of the numbers of the dead, but even this is unreliable, for nothing had yet been heard of the four towns up the valley from Johnstown, that were first involved in the disdaster, Mute testimony as to their probable fate has been found in the identification of the bodies of several of their former citizens that have been taken from the ruins of their cities down the river. A temporary martial government has been established over the ruined city of Johnstown, under the Adjutant General of Pennsylvania, assisted by military companies from Pittsburg and by volunteer officers. Attempts at disorder and violence by small gangs of tramps have been vigorously suppressed, and several marauders have been lynched and shot to death, for the people in the solemn earnestness of their work of succor and rescue have not the patience to wait the tedious process of law. The area of disaster from the floods is extended considerably over what was originally reported, and a sense of apprehension will prevail until the cities in the valley of the Cumberland, the Shenandoah, the Juniata, and the upper Potomac, that have been cut off from communication with the outside world since last Thursday shall be heard from again. Organized and systematic efforts to provide food and shelter for the homeless thousands that are now exposed to the elements in the desolated region are earnestly called for. Meetings for the purpose of responding to the call have been ordered in several of the larger cities. That in this city will be held at the Mayor's office this afternoon. With the partial restoration of telegraphic communication fuller particulars of the great disaster have come to hand and are given below. The cause of the calamity, it is admitted by the President of the South Fork Fishing Club, the proprietor of the artificial Conemaugh Lake, was the weakness of the dam alone. No cloudburst or waterspout occurred to compel it - the frailty of the dam and the tremendous pressure of water behind it was the only cause of the catastrophe. Johnstown, June 6 - The certainty of the towns along the Conemaugh and Allegheny Valleys being subjected to ravages of an epidemic of typhus, or at least typhoid, fever this summer has been doubly assured by the course pursued by the persons who are now engaged in clearing the debris in the river at Johnstown. Over an area of nearly three acres, in the end of the city and directly north of Main-street, are pitched quite fifty tents, occupied by relief corps from several cities in Southwestern Pennsylvania. Curious to record, there are a number of women and children in this camp, while the temporary town is occupied by a floating population of quite twenty thousand. The flood deprived the entire district of any system of drainage, even the cesspools being destroyed. The river now flows over several hundreds of putrefying bodies, besides acting as a sewer for the entire district. The Conemaugh is a tributary of the Allegheny River, which in turn supplies most of the water used in Pittsburg and Allegheny. In all, the number of persons the river supplies with water is nearly four hundred thousand. With this great district in which to spread contagion and pestilence, the State Board of Health is peculiarly indifferent to the condition of affairs in Johnstown. The district which is being cleared is part of the most thickly-populated of the town which was overflowed. There has been no effort made to dig below the surface of the city as it was left by the deluge, and from the fact that, in the immediate vicinity, bodies have been found in the debris at the rate of five an hour, the logical inference is that in all likelihood there are scores of bodies mixed with the heavy timbers and other wreckage which were driven down upon the town by the flood and then covered with a thick layer of mud from the river bottom. Thus at a distance of not more than two feet below the surface there are corpses which will be a continual menace to the health of any person who remains in the vicinity. This plot already is nothing more than a neglected Potter's Field. Dr. Lee of the State Board of Health, assisted by a number of volunteers, is working hard to smother any awakening of pestilence, but he needs a corps of physicians who are experienced in epidemics caused by infection. Such men may be readily obtained in the force of the Board of Health of the various large cities of the country, and should be secured by the State authorities. Dr. Lee and his associates made a house-to-house inspection of the upper part of the city to-day and a woeful state of affairs was discovered. In many houses thirteen and fourteen persons were found living in a single room. In many houses it was discovered that the windows were tightly closed to keep out the stench of decaying bodies and animals. To add to the difficulties and to increase of danger, the supply of disinfectants is inadequate. The supply on hand has been exhausted, and Dr. Lee has telegraphed to the Surgeon General of the United States to send some at once. He received a reply that all the disinfectants available, three carloads, had been sent and were now on the way. This will not be one-tenth part of the quantity which will be required. Dr. Lee said that there were two carloads at Ebensburg from Philadelphia, and that they would arrive to-morrow. Another requisite for disinfection is tar. There are many bonfires ablaze now, but their smoke has no quality for good. The odor which would arise from the burning tar would, according to Dr. Lee, be of incalculable value to the hill dwellers, as well as to the temporary residents of the destroyed city. That the danger of the poisoned water is fully appreciated in Pittsburg is evidenced this morning by the distribution of a warning by the President of the local Board of Health, instructing the citizens that henceforth they should filter and boil water needed for household purposes before it is used. The circular thus distributed says the necessity for these precautions is imperative, for already the Allegheny River water is unfit to drink. The result is that water is not so popular in the prohibition-leavened city of Pittsburg as it has been.